Those of you who haven’t met us in real life may be forgiven for thinking that all we do is dream about travel and eat. And eat and travel. Well, almost. While I must admit those are indeed favorite activities, my first and constant love is reading. Below are three books (both children’s and adult’s) we’ve (Melissa and her munchkins) read recently that we thoroughly enjoyed and recommend to you. Ok, so this book shouldn’t put to you sleep — the research on how sleep affects us and our brain (and whole body and every aspect of our health!) was fascinating. Well-written and not overly dense, it left me with a scientific backing for a guilt-free prioritization of my eight hours of the best. (Although bewilderingly the first chapter was full of wondering at how sleep evolved, and explanations as to how fundamental it is to life, which made no sense to me as to how life could have existed without sleep… but anyhow.) 4 stars. I went into this book knowing really nothing about geopolitics, and ended it having (I think) a solid introduction to the subject. The author explains how geography affects commerce, wars, culture, and current events, both past and present. (Mountain range in the way? Who knew that that’s part of the reason why that country is the way it is…) Concisely written, yet covers a lots of ground (so to speak…); it made several historical events make a lot more sense, and left me curious to read more about geopolitics. 4.5 stars. I was browsing the juvenile audiobook section at our library when I spotted Chitty Chitty Bang Bang and thought, “Oh, cute classic child’s book. Sure.” Little did I know that we were in for a rollicking adventure full of a magical car, a secret cave, gangsters, a trip to France, and a kidnapping, all satisfactorily settled in the end. (I suppose I shouldn’t have expected less from the creator of James Bond. Yes, that Ian Fleming.) My eldest was absolutely enthralled, and begged me to turn it on every moment we got into the car (and wanted to listen to it again immediately upon finishing it!). 5 stars from the Krewe! I’m currently on the hunt for a fun rollicking book of my own to read; I usually turn to a Daniel Silva, but I’d love to get a fresh recommendation! We interrupt our regularly scheduled programming for a throwback post in honor of Tintin’s 90th birthday! If you are unfamiliar with the Tintin books, the comic strip follows a young reporter around the world as he thwarts nefarious plots. Originally published in Belgium (and hence in French), they are widely available in English. (Here is a helpful overview and recommended reading order of the Tintin books. 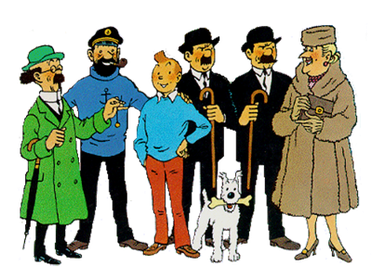 And the 2011 TinTin cartoon did an excellent job of capturing the spirit of Tintin and weaving elements of many of the books into it too! ) We grew up reading the comics and love(d) them. We had the opportunity to visit the gorgeous Château de Cheverny when we went to France in November of 2017, and I may or may not have been particularly excited to visit, given that it was the inspiration for Captain Haddock’s Marlinspike Hall in the Tintin books! (If you “cut off” the two outer sections of the château, you have the Hall.) The château was delightful in its own right, but the Tintin exhibit didn’t hurt. After watching the hounds’ feeding, we strolled the gardens, then went into the Tintin exhibit. If I remember correctly, we had to to purchase tickets that included this option. Lucky for us, kids under 7 are free! They also offer a family option for tickets. Honestly, since adult tickets are under 20€, I didn’t feel like it was exorbitant to begin with, but I’ll take my discounts where I can! Plus parking was free and easy. I felt like a child again myself wandering through childhood memories brought to life. We then toured the château itself, and wandered around more of the grounds and the gardens (simple but gorgeous). We visited on a fall day and loved it, but I can see this being a fabulous place to visit in the spring (when apparently you can take a boat ride).